In our Letter Dated 9th December 1996. Enclosed is Van Elle Southern Ltd’s drawing of the work to be carried out. The contracted and specified depth of the 200mm dia piles should have been 13.000m deep, with steel rebar 2no T12 + 8.0m. All of the piles have to go a lot deeper than what has been done, as outlined in the test bore, which you carried out,and by what basis Brian Morton, of the Morton partnership specified that the piles needed to be 13 .000m deep. Van Elle Southern Ltd quoted to and were contracted to put piles in at 13.000m deep at 200mm dia, which they have not done. 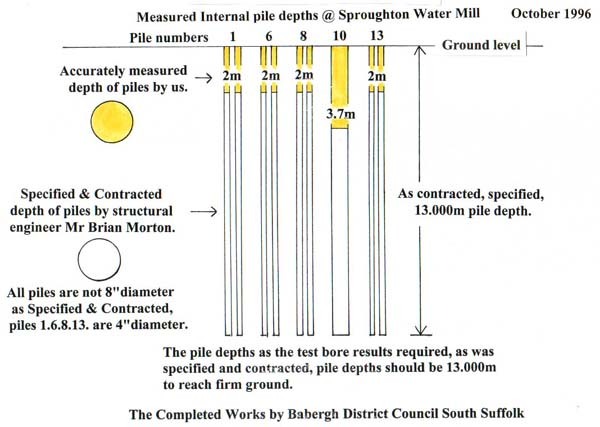 The piles as the work has been done, are still in the gravel of the river bed and they do not reach solid ground, as specified by Brian Morton of the Morton partnership based on the test bore results. 2. The diameter of the piles is not as per contract or as specified by Brian Morton of the Morton partnership. Reference: -Van Elle’s drawing dated 19th June 1996. Piles numbers 1.6.8.13. The diameters of these piles are 100mm diameter and not the specified 200mm as quoted to and contracted to do. The depth of these piles could not be checked, because they were all piled, steel reinforcement put in, and poured with concrete on the same day. 3. 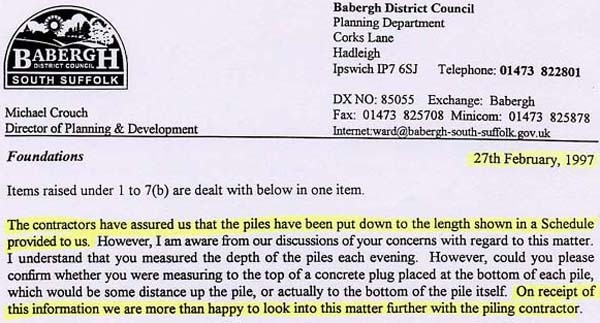 Depth and diameter of piles, the needle size, and steel reinforcement, Van Elle Southern Ltd did not inform the building control department at Babergh District Council to come and inspect, to check the piles, and the needles before the pouring of the concrete. As none of this work has been checked by your on site supervisor Brian Morton or the building control department at Babergh District Council too see if the work had been carried out as specified, who guarantees the work and, who is responsible! 4. The steel reinforcement put in the piles is not as specified. 5. Who will give us, and be responsible for the long-term guarantees on the work, as it is carried out? 5a. Van Elle Southern Ltd as per the contract, only guarantee the materials they have used in the piles and the needles as existing, but do not guarantee the design or how it has been done. 5b. Brian Morton of the Morton partnership and Babergh District Council can only give guarantees on the design and the piling of the mill, when Van Elle Southern Ltd have done the work as specified and as they were contracted to do to his precise design. 6. 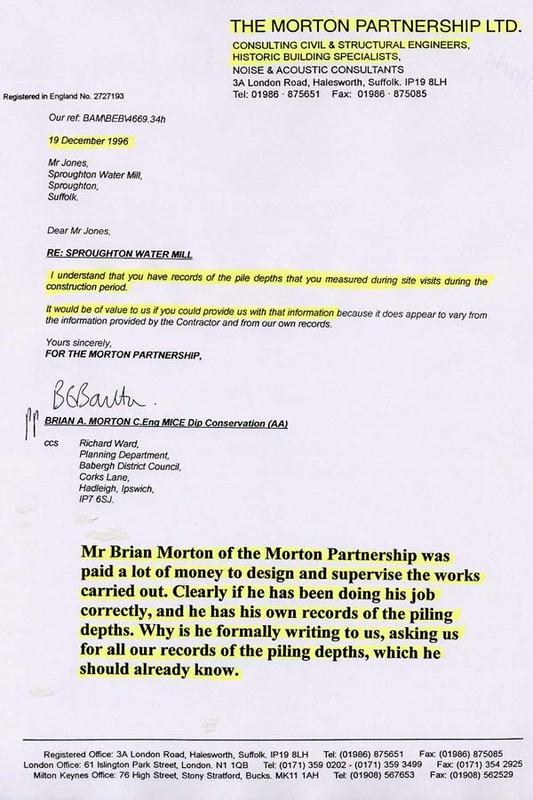 We have evidence that before Van Elle Southern Ltd came on to site, it was decided that they would not pile down to the depth specified by Brian Morton of the Morton Partnership as per contract and designed to. As outlined by the delivery note ( See Enclosed ). There were not enough materials (steel tubes) delivered to site to carry out the works as specified. I was there when the steel tubes were delivered and there was plenty of space on the lorry (which had come from the West Midlands) for more steel tubes, if they had been ordered. No extra 200mm steel tubes were delivered to site. 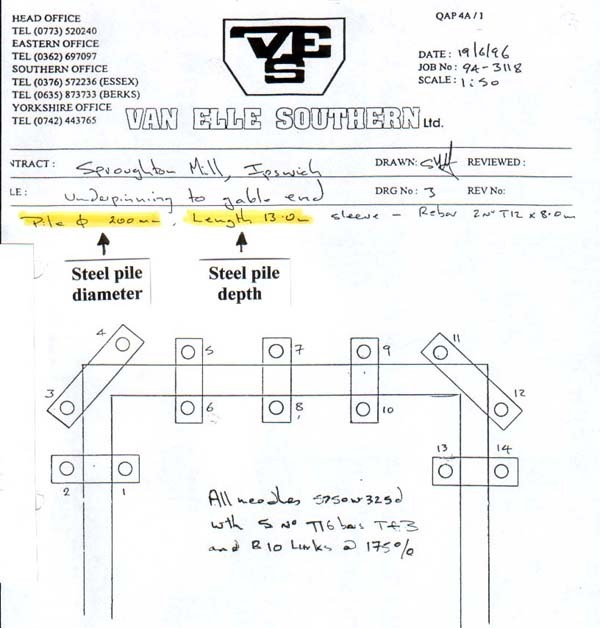 Van Elle Southern Ltd is not the type of company to carry all these very large and heavy steel tubes from job to job. These steel tubes had to be delivered by a crane off the back of a lorry as they were so heavy and cumbersome, it would be too much work to manhandle the extra 42 number steel tubes needed to complete the work as per contract, as the job was planned only for the duration of five days for the piling. Each steel tube is 2.000m long with a 20cm collar sleeve on top and bottom, this makes the steel tube 1.800m long when joined together with other steel tubes. When calculated together you need eight lengths of steel tube to reach 13.000m deep, the specified and contracted depth as per the test bore. In total there should have been delivered to site, 112 steel tubes from the West Midlands, and it will take time to order more steel tubes, the contract time for compaction piling was five days. Delivered to site were only 70no lengths of steel tubes at 200mm diameter. The number of steel tubes used on site was only 36 lengths of 200mm diameter. I know this because I counted them in and personally counted them out and recorded it on film, and in writing. This also confirms the depth of the piles and can be calculated exactly allowing for the wastage for cutting the top off the steel tubes. 7. Fundamental Design Fault which we confirmed we were not happy with, the compaction piling of only part of the mill. Also using compaction piling around the mill, with a 3/4 ton compction hammer, which it is not suitable for using this type of piling, as it is a listed building, and it has lime and putty mortar joints between the soft red bricks, and it will increase the cracks around the mill. Additional comments regarding the repairs to Sproughton Water Mill to be added to our letter of concerns dated 9th December 1996. 3. Foundation piles numbers 1, 6, 8, 10, 13, the internal foundation piles, we have never known exactly how deep the internal piles were, because they were all piled, the steel reinforcement put in, and concrete in one day. Even though the same amount of foundation piles, for the outside of the mill, took one week to complete. This speedy work at the end of the contract, when the contract time allowed, had run out, arose are suspicions for a start. 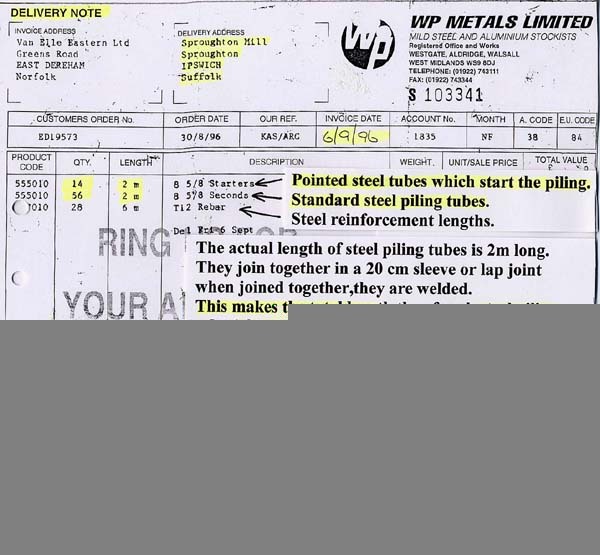 Now due to detailed records taken at the time, the 100mm or 4” diameter steel tubes were delivered to site on Saturday 14th September 1996, and photographs were taken at 3 o’clock on Monday 16th September 1996. We can calculate the average depth of the internal foundation piles; pile 10 was the specified diameter pile of 200mm or 8” to a depth of 3.700m only. This leaves four number foundation piles numbers 1.6.8.13. which did not have the specified diameter pile put into them (200mm or 8”) but had 2no 100mm diameter foundation piles driven in, by an air compressor and not by a compaction piling machine to match the others. Quite Clearly those who were supervising the works, Brian Morton of the Morton Partnership, Bethnal Green, London, Richard Ward conservation officer at Babergh District Council, plus those responsible for checking the works at building control, quite clearly have explanations to make, to the standard of their supervision of the works carried out here, and what has been done with the piled foundations and who authorised it. Also the depth of the external piles as outlined in my previous letter dated 9th December 1996, needs some explanations. Also to confirm our point, regarding the depth of internal piles, we have it on record that on Saturday 14th September 1996, the large Compaction piling machine, 34no steel tubes that are 200mm in diameter, the welding and cutting gear was taken from site, to another job which was going to start on Monday morning the 16th September 1996. With no welding equipment on site, on Monday 16th September 1996, you cannot have joined any steel piling tubes together, because they have to be welded together so they are watertight, as they are piling through gravel and water. 4. Questions regarding the foundations, the piling, the quality of workmanship, and the supervision of works, which we need answering. A. Why have major cracks open up at a centre of the rear elevation (North elevation) up to 1/2” inch between the new & old brickwork? B. Also you have confirmed that cracks have opened up in the gable end, by the Mill house, (west elevation) in your letter dated 24th December 1996. Which was being supported by your structural scaffolding. C. Also major cracks have been seen enlarging on the front elevation (south elevation), at the east end at first floor level. We have photographic evidence, which quite clearly shows all these cracks have opened up, since you have carried out the compaction piling works to Sproughton Water Mill. 5. Major movement in the half lap joint in the roof plate. 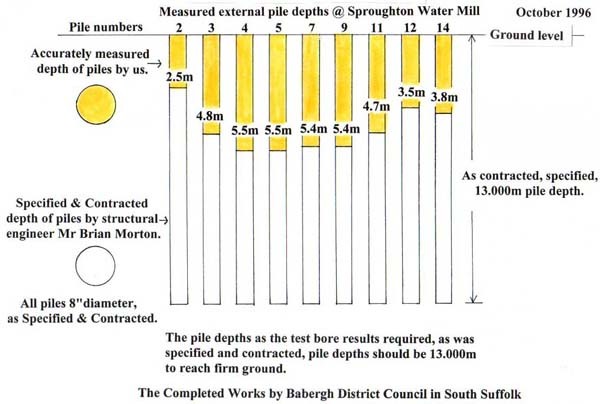 We have conveyed to Babergh District Council, all the information we have regarding the piled foundations, but I have had no response or information from them, except denials that anything is wrong. In October 1996, I contacted Rodney Cage, Building Control Officer for this area, at Babergh District Council, to discuss our concerns regarding the works, which had been carried out to the Foundations & Piling at Sproughton Water Mill. But we were amazed to find out that Rodney Cage, Building Control Officer started two weeks holiday on Monday 13th September 1996, which is the same day piling started at Sproughton Water Mill, he did not inspect any of the works carried out, Piling depths, Steelwork, Concrete Needles etc. We asked; Who had inspected & approved the works to the Foundations & Piling, from Building Control? He said he did not know, but understood Richard Ward, Senior Conservation Officer, had been arranging and supervising the works. We have asked Babergh District Council on many occasions for copies of full details of the works carried out, the Supervision, Building Control reports etc,etc. But Babergh District Council is very reluctant to give us any information, on what they have done to Sproughton Water Mill. What are they trying to hide!